Monday, what a day….what a great day….woo hoo! Comments Off on Monday, what a day….what a great day….woo hoo! Been waking up early, thank you Chatty Cathy green parrots – even before daylight! However, it’s so peaceful to sit on the rancho and enjoy the quiet, sipping on fresh squeezed orange juice and a cuppa fresh brewed 1820 in my cup. Some mornings the coffee is extra special with a little Cafe Rica in it. Monday’s are when Maricela comes to clean. 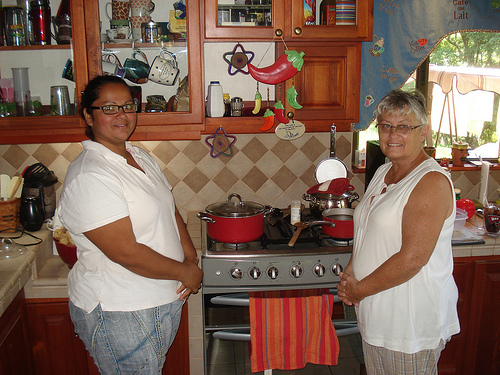 I decided this Monday that I was going to broach the subject of learning to cook Tica style. I love the Gallo Pinto whether it’s served with a meal or for desayunas (breakfast) – when it’s served then, there is an egg on top. I think she was very pleased to help me….so between her cleaning, she would stop and help me with the next step. It smelled so heavenly cooking….how fun to go in the yard and snip off oregano from the “grande” bush and throw it in the pot with the beans. Didn’t use the rice cooker to make the rice either. It’s all about back to the basics in Costa Rica. This reminded me of how excited I was last Christmas season when I “horned” my way into a Tico family of making tamales. That was pretty cool too! After she was done cleaning, I needed to run into town to see Dra. Candy because of this stupid cough I have developed. It’s driving me nuts….yeah, I know, that’s not very far. Now I’m at the Vet’s getting more eye drops and ointment for Sofi. I know Doctora Sharon’s income has improved immensely since we’ve moved here because we are very good customers/patients! But it’s still a third of what it would cost in the states. Sofi and Derby will be back at Doctora Sharon’s on Thursday for their day of beauty. Need them to look good because Amy arrives next Thursday and is bringing a friend with her, April. Headed to the grocery to pick up a few things. While in the grocery, it started to rain….these tin roofs make it sound like it’s raining cats and dogs, but when you go out in it, you are hardly wet. Then to the drugstore to get the prescriptions filled. This actually took longer than visiting the 2 Doctoras. On the way home, it was raining and I could see some fierce lightning over a mountain ridge from where we live. When there’s lightning in the area, we unplug all electronics just because we don’t want anything fried. But darn the luck, we were fine, but the internet got fried. Mark called and they said one of their transmitters took a direct hit. Who knows when we will be reconnected to the world and this will get posted! 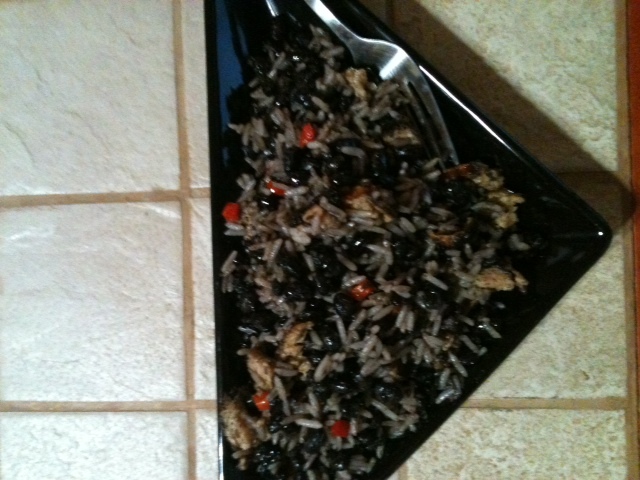 Came home and fixed Gallo Pinto for dinner with some fresh chicken sausage in it. Very tasty! After dinner I hear Maricela, Dylanna and Nazareth calling for me. Met them at the gate; her son was also with them. She wanted me to take in a pair of jeans for her son because his school was going to ZooAve today. It’s a pretty cool zoo – we’ve been there a few times already. So in my broken Spanglish I figured out what she wanted. She kept holding up “dos” fingers and putting them on the seam…finally Dylanna says in perfect english: “two fingers”! The look Maricela gave her was absolutely priceless and Mark and I are laughing hysterically. Told her to give me 20 minutes and then I’d bring them to her house. Used a long basting stitch to make sure I was taking them in enough – the width of two fingers. Needed to be taken in a little more – so I said “tres” not “dos”. We all laughed at that. So back up the hill I trudged to take them in a tad more. When I arrived again having taken them in, her son tried them on again and said “perfecto”. That I understand!!! In the meantime, I noticed Nazareth and Dylanna are doing homework. Dylanna is working in a fifth grade English book. I had suspected she knew more English than she was letting on! She’s speaking extremely well. Back up the hill to use the overcast stitch to finish the pants and put in a hem. Next thing we hear they are at the gate again; carrying fruit and bread, etc. for us. They were calling for Mark. Dylanna had her English workbook with her. Mark asked her to read from it….she’s becoming more comfortable with us in using English! YAY….for us! We also found out that Maricela’s 15 yr. old son went to school in Guacimo and they don’t teach English there. They are sending the girls to the school in Atenas because they will learn English. Kudos to Maricela and Luis! I’m in the house frantically sewing and trying to get the jeans done; Mark is in the driveway talking with them. Maricela said that Dylanna is very intelligent – then she made the comparison that Mark and Dylanna get along well and Nazareth and I get along well when it comes to speaking Spanish! The jist of that means, Mark and Dylanna are the brainy ones, Nazareth and I are the fun ones! Yesterday was just one of those days that makes you feel like you belong and this is truly “home”! A little tidbit FYI….schools here are out the end of Nov. or sometime early Dec. for their “summer break”. They return to classes around the first of Feb.
I’ve met my inner-child solemate….. Comments Off on I’ve met my inner-child solemate…..
Maricela and Louis live in the first house inside the electric gate to our development. They are considered “the gate keepers”. They have 2 daughters that live with them….Dylanna, age 11, and Nazareth, age 7. Dylanna is as quiet as Nazareth is outgoing. Two complete opposites. There son, age 15, has chosen to stay in the former house that Maricela and Louis lived in….first house next to our development. Altho’ I’ve noticed, he’s been coming around our development more and more. This morning as I was sitting at the embroidery machine, the dogs were raising a ruckus and I could vaguely hear my name being called over all the commotion. Nazareth had come to show me her “hula outfit” and in our broken Spanglish, I figured out it was something for her school class! She loves dressing up and coming to the gate to show me!!! A little while later, there was another commotion and Nazareth is yelling “Nancy, Nancy”….I peaked out the bedroom window, grabbed my phone, because there was another Kodak (guess I can’t use that word much longer) moment in the making! This time I was greeted with this outfit! 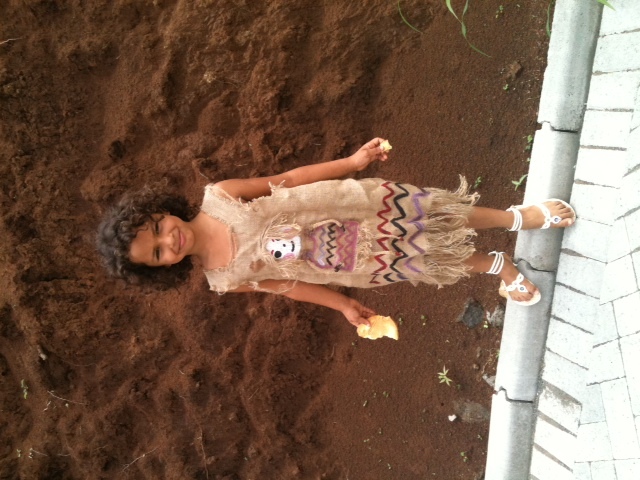 This was an Indian outfit that Maricela, her mother, wore when she was in elementary school! I love that Nazareth loves to dress up! I love that she comes to the gate and wants to show me! She and I get along so well…..I think I should look for some formal attire for her at Ropa American (Costa Rica’s version of Goodwill) and cut it down so it will fit her! Wouldn’t that be a hoot? Life is great! Pura Vida! Mark said I need to add more pictures to my blog because not everybody is my Facebook friend where I put most of my pictures. He is going to add the wordpress slider plugin called Slidedeck which will draw images from various places I put pictures and video… including Flickr.com and Twitter and YouTube. He promises that it will be “automatic” and “simple”… yeah right. I’ve heard that too many times. So we’ll see if Slidedeck lives up to his promises. We think everyone deserves a simple solution to present their content in a beautiful way. SlideDeck 2 is designed to be smarter, more flexible and even prettier than before. We’ll see how simple… if I can do it, anyone can! Now that we’ve been living in Costa Rica for almost a year, unbelievable that it’s been almost a year, I can say there are some things I miss from the old country. We’ve decided to refer to the U.S. as the old country. I miss my magazines! Yep, can buy magazines in Costa Rica that are in Spanish….wonder if the day will ever come that I feel comfortable enough to do this? I miss being able to shop in a real fabric store with all the necessary items you need to complete a project. There are many fabric stores in Costa Rica, however, they don’t carry thread (except for one in Grecia), and sewing notions. I have yet to find a pattern in Costa Rica and I definitely need a pattern for guidance! It is not fun running from store to store to find these items. I miss my garbage disposal! Immensely! I miss being able to go to a clothing store and having a wide variety to choose from. Can’t wait till October when I return to the old country. I’ll be a shopping fool! I’ll be first in the stores when they open, and last to leave when they close. I miss my knitting group at Panera on Friday! Perhaps the week I’m in the old country, they’ll feel the need to meet more than just on Friday. I love that all gas stations in this country charge the same price for gas! I love the happy, friendly people in this country. I love the weather, the freakin’ great weather! I don’t ever want to be cold again! Hear that KY, no cold weather the week I’m back there! I love the fact I wear flip flops EVERY DAY!!! I’ve dubbed the flip flops as the shoe of Costa Rica! I love hearing the birds singing in the a.m. – however, the parrots could start their chattering a little later in the day. I love hearing the geckos chirp that are now living in the house. They eat bugs, they are our friends. I love all the new friends we’ve met from all over…it truly is a small world! Met people that now live here from Nashville….how ironic is that? I love that I have friends that are coming to visit us! I love sharing our new lifestyle with old friends. It’s not for everyone, but it really is a relaxing place. I love the fresh fruit and veggies available year around. Coffee is pretty darn good here too! I love the healthcare here! Drs. are willing to work with you and before sending you on to specialists, they make phone calls in your behalf and talk with specialists to how best treat your problem. (ie: thyroid, is now at a “normal” level and I only worked with 1 Dr.m but she called endocrinologists to inquire how best to treat it). You know, I really feel we made the best move EVER! We have no A/C bills, no heating bills, economical healthcare, lots of friends, (you don’t have to look very hard to find someone to go out to eat with you), no one is in a hurry; everyone smiles. Have many friends that have visited the old country and they all say they couldn’t wait to get back to Costa Rica! They feel the old country is a “rat-race”, everyone is in a hurry. If you are looking for a place to visit with happy people, check out Costa Rica. No, it’s not perfect, but it beats living in a “rat-race”. Miguel, my pet Iguana, is sunning himself on the rock outside the bedroom doors. Guess the dogs are getting used to him because they don’t bark at him anymore. WOO HOO! One sock done, one more to go! Comments Off on WOO HOO! One sock done, one more to go! 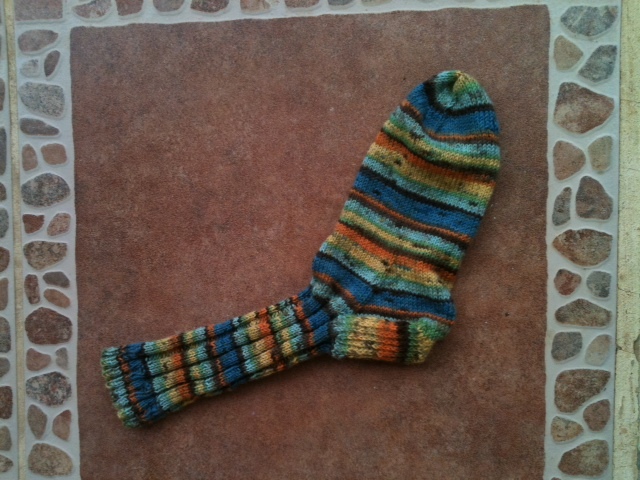 Just finished closing the toe of Amanda’s “first” sock with the kitchener stitch. Altho’ the foot of the sock looks large, it’s not when you put the sock on. I sent her pics of sock yarn that I had and she picked it out. I think it knitted up pretty cool! Just a rib stitch all the way down the leg. Need to get busy on the second sock. I didn’t use one pattern as written, but used a ribbing and leg pattern from one, and then a foot pattern from another. Off to start the second foot…. Yesterday, Friday, was the “Over 60’s Ladies Day Trip”. We were to take the bus to San Jose, visit the Artisan Market; and do LOTS of shopping! I knew this would be right up my alley! Six of us met at the bus terminal about 8:40 a.m. We got in line to board the bus to San Jose. The last one of us to board, Rosemary, asked the driver if this was the correct bus to San Jose. Well, error number 1! LOL We were on the bus to Alajuela. So the “gringo ladies” made their way to the front of the bus and got our refunds and quickly got in line for the correct bus! It was all of 800 colones for the ride to San Jose (about $1.50). Didn’t seem like a long trip at all even with the stops on the way there. I was quite proud of the fact that when we were in San Jose, I recognized the corner where Mark and I caught the taxi to sign up for CAJA – it’s just a few blocks from ARCR. Arrived at the bus station and the adventure began. Walked a block or so and then turned left and then we hiked down the pedestrian mall. The Artisan Market is at the “end” of the pedestrian mall. Shopping heaven! I cannot wait to go back!!! Terri, be prepared, we’re heading there when you come. It reminded me of the old market place in downtown Cancun. Vendors greeting and asking you to come in with the line “for you today, 30% off”. I had a newly charged battery in my camera and was amazed at all the things to see, I didn’t take pictures! Saw lots of different things and some really unusually jewelry. After we moseyed through the market, we then headed back down the pedestrian mall; stopping in various stores, etc. It was hot shopping in the stores and many times I just walked out to the “mall” area to partake of the wonderful breeze! Headed to San Jose’s Central Market lunch. Ate at a small place with wonderful food! You know you are going to get great food when you are the only gringos in the place! It was fun!!! Then back to a couple of other shops and on to the bus station for our return trip home. Lots of fabric stores – Gayla, are you reading this? On the trip home Mary and I sat in the front seat of the bus! This is not a seat for the faint of heart! The way those drivers maneuver those huge buses through the narrow city streets is amazing. At one point there were two lanes of traffic….we were passing a semi with the huge lug nuts that stick out of the wheel hub and I swear we were close enough to shear them off!!! Arrived safe and sound back in Atenas! No one bought a lot but everyone kept saying “I’m going to come back here”. So we drove down the road and ate at Bar Ril – home of the $6 lobster! Fell into bed when we got home….exhausted, but what a great adventure. I am beginning to feel more comfortable riding the buses here. In fact, Jonny and I are going to Orotina on Monday on the bus. Today was just a relaxing day – not that it’s different than any other day. Picked up Jonny and headed to Kay’s for a breakfast buffet; as always, it was very yummy! Came home and it was so H-O-T! I mean really, really hot! Actually, it was the super high humidity that made it awful. We could look into the valley and you could see the humidity. Mark grilled some steaks and we had those mid-afternoon. Then to use up some of the mangoes we have, I made mango bread. Maricela had given me some avocados and I used those in bread too. Smelled really nice baking! However, it really did heat up the house. DUH! Early evening we could hear Dylana, Nazareth and Maricela at the gate. They have all three had birthdays since last Tuesday! Nazareth was 7 yrs. old today. We had given her some glittery angel wings with a glittery headband, and magic wand and she wanted us to see her. She was just adorable in a maroon colored dress and the pink bling made it! I gave them a loaf of avacado bread. We said good night and off they went…. A little bit later we heard them at the gate again. OMG! You are not going to believe this! They wanted to give us a little green parrot for a pet! I yelled for Mark to come rescue me….he came out with Sedona and Derby who were immediately intrigued with the baby bird! After convincing them that the parrot wouldn’t last long with the dogs around, they headed home. They were disappointed but understood! Funny ending to a nice, hot day!